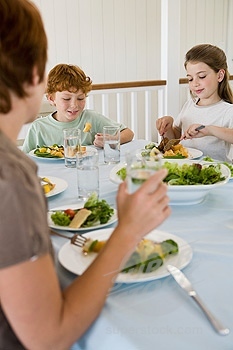 In this ever-increasingly busy world dinner has become a task rather than an enjoyable event for so many families. If that is the case around your dinner table then today is the day to take dinner back! Cooking simple meals does not mean that you have to leave out flavor or good ingredients. You can create wonderful family favorites with just a few things on hand and very little time. I can�t give you more hours in the day, or less to do in the 24 you have, but I hope that these recipes can help you enjoy meal time a little more � simply and deliciously! Put the two cans of broth in the crock pot with equal parts water. Add the cream of chicken and the seasoning mix from the mix and stir well. Add the chicken and veggies. Make sure the veggies are cut up in pretty equal pieces to ensure even cooking. The rice is up to your preference. If you want a firmer rice, add it in about an hour before you are going to serve the meal. If you want don't care, add it immediately. It gets mushy that way, but not in a bad way. Combine the drained hamburger meat, mush. soup, and lipton mix. Bring to boil. Pour over cooked egg noodles. Mix well. Place in crockpot on low 6-8 hours or until chicken is done. Can also be cooked in oven at 350 for 1 hour if preferred. Serve with rice and steamed vegetables. In a small saucepan over medium heat, combine the cream cheese and salsa. Cook, stirring until melted and well blended. Stir in chicken and pinto beans. Fill tortillas with the mixture, roll and place into the prepared baking dish. Spread cheese over the top. Combine cabbage, onion, brown sugar, and vinegar in 4 to 4 quart slow cooker. Sprinkle roast with salt and pepper and brown in heavy skilllet, about 5-6 minutes total, turning until browned on all sides. Place pork in slow cooker; cover, and cook on Low for 7-8 hours until pork registers 160 degrees F.
On each of 8 metal kabobs, thread shrimp, pepper chunks, and whole mushrooms, allowing a bit of space in between each ingredient. Measure out 1/4 cup Italian salad dressing and set aside for salad. Brush kabobs with remaining salad dressing and grill or broil 4-6" from heat for 4-6 minutes until shrimp are cooked, turning once and brushing once with salad dressing. Toss salad with reserved salad dressing and serve with kabobs. Serve kabob on top of salad for a delicious contrast. Over medium heat, combine canned chicken and soup until well blended. Scoop over rice, add chow mein noodles, and then heap on the toppings! Everybody gets their own custom meal with very little effort. The fresh cooked tortillas add so much to this meal so if you can get them at your local store I highly recommend it. Cook tortillas on griddle in order to cook two at a time. Scramble eggs and add cheese and cooked meat in at the end. Roll into fresh tortillas and enjoy with ketchup or salsa. Preheat broiler. Line a broiler pan or baking sheet with foil, then coat it with cooking spray.